Last year in March, I happened to be toasting my glass in view of the Acropolis thanks to a nice surprise from my wife and son. The next day, we took a long walk in Plaka. Everyone we met, including the Jamaicans performing music and dancing on the street, spoke in Turkish to us, albeit a few words. When we reached the end of the road after passing dozens of kebap restaurants on each side, we sat down to have a coffee. This was our usual Turkish coffee (they call it Greek coffee – in fact there is even a Turkish brand coffee machine in the airport lounge where you can prepare and drink freshly). Some people were playing backgammon at the table next to ours. A street vendor tried to sell us trinkets. As we were returning to the hotel from the same route, my son who had not been to Athens before said, “Dad, if there is a part of this town that resembles Europe, could we go there? This looks exactly like İstanbul” . We are so similar with our neighbour Greece. We eat and drink the same things, we emote to the same melodies, and we live in similar houses and deal with similar economic crises. They dance sirtaki, we dance kasap havası to the same music. We are similar indeed, but they don’t attack people who set up a drinking table in the streets with machine guns. The research director of National Hellenistic Research Foundation, an institution similar to our TUBITAK (we met him, he is a biochemical engineer not a zoo keeper!) researches and publishes articles on usage of ultrasonic sound waves in decomposition of chemical substances to eliminate problems arising from heat treatment process; whereas in Turkey a study on “productivity gains of beans that were subject to prayers” gets rewarded. They stay true to originals when restoring historical sites; we make the 2000 year Şile Ocaklı Island Tower look like Sponge Bob. As such, our neighbour does differ from us, and the difference is not one to be taken lightly. 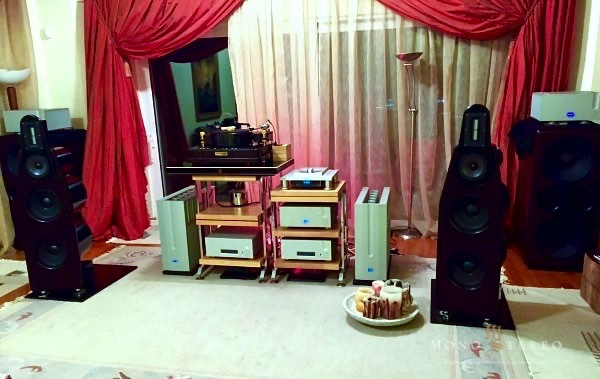 Our neighbour’s audiophile community also does not resemble ours. 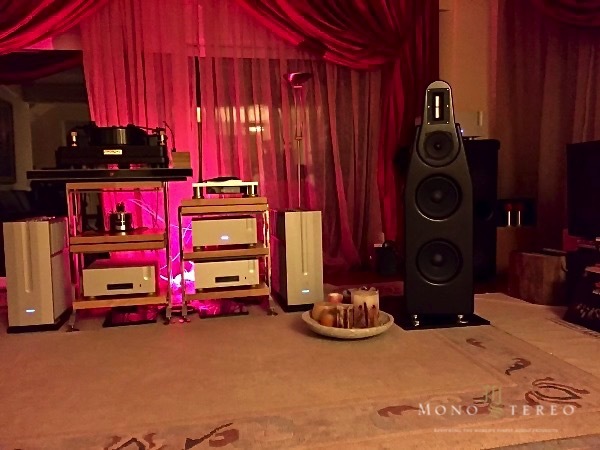 ACA (Audiophile Community of Athens) members do not boast about having the most expensive and impressive looking systems; they are on a quest to find the most musical ones. Of course, some have systems worth fortunes, but there are also ones who produce their own electronics. Not an insignificant number of members have Ypsilon Electronics equipment at their homes. Please don’t say, “What more, that’s the top of ultra high-end!” Ypsilon is after all locally produced electronics for our neighbours. We have recently paid a short trip to Athens with my son and Ozan Turan of Audioavm, the distributor for Ypsilon Electronics in Turkey. 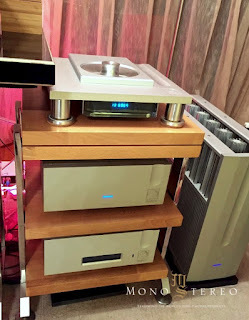 We saw how Ypsilon electronics were manufactured, had ouzo with the Ypsilon team in a tavern and were guests in George Heropoulos’ home (the President of ACA- Audiophile Community of Athens) that same evening, taking in the most incredible musical feast ever into the early hours of the morning. This short but intense trip left such good impressions that I was compelled to share them. I also expect that this article will be informing music lovers about Ypsilon which is a new brand to Turkey. 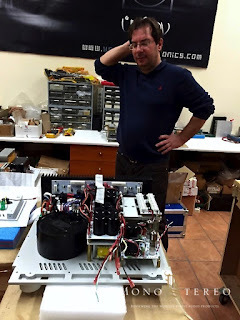 Ypsilon Electronics was formed in Greece in 1995. It aims to create music in live performance quality in homes. 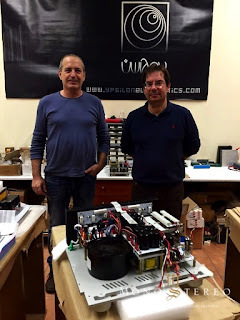 Its founders Demetris Backlavas and Fanis Lagkadinos are actually expert engineers in live music systems. 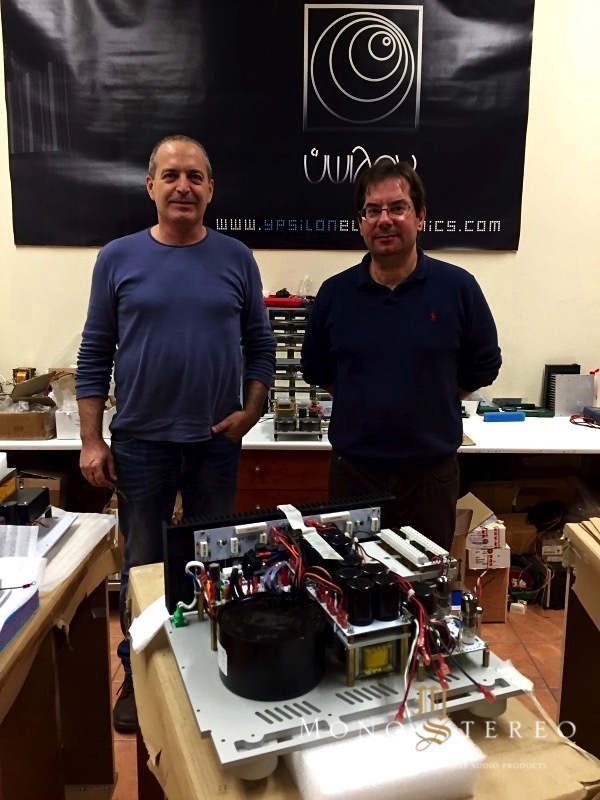 They used to design tube amplifiers and speakers in their spare time before founding Ypsilon. Every equipment they have produced in the last decade has become a legend. Demetris Backlavas – the designer, brain, part creative director and spokesperson for the brand – has been dubbed Einstein of audio world. I had the opportunity to meet him in the last Munich High End show, but I really got to know him and his partner Fanis during our visit to Athens. Demetris is a shy and unique person who doesn’t mind showing personal interest in every Ypsilon owner. He defines himself as a microphone rather than an engineer. He actually listens to the reference system set up in the workshop at every opportunity as if he is listening to it for the first time, with a critical ear like a microphone. Fanis is not a man of many words. He listens all the time too. I had the chance to chat with him over lunch, we gossiped about audiophile cables. Obviously he has a wealth of knowledge on the subject. He laughs at overly expensive cable brands. He prefers silver as conductors. Actually they use in-house designed silver cables in their reference system. The subject of cables is a dubious one. I will write about it at a later time. 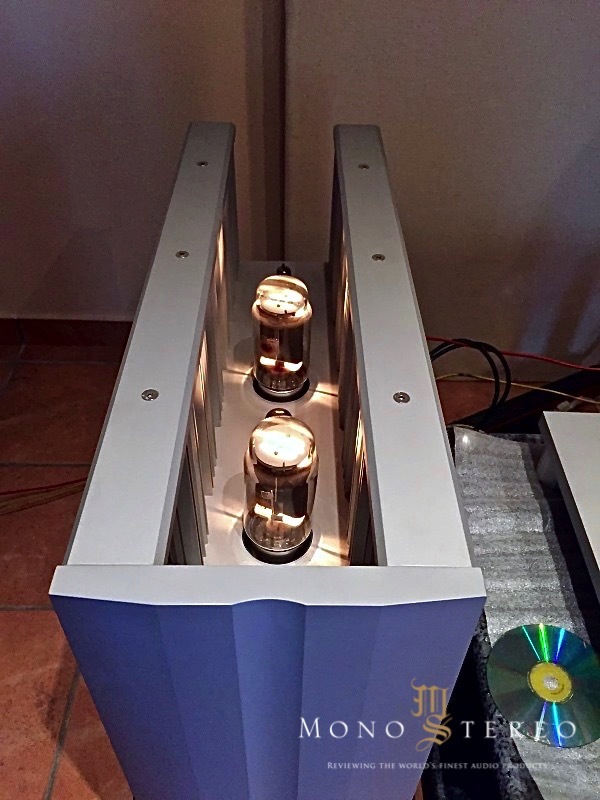 Ypsilon’s first product was a hybrid integrated amplifier aimed at the local market. The first example of the current product range however is the SET-100 tube amplifier developed over 2002 – 2003. 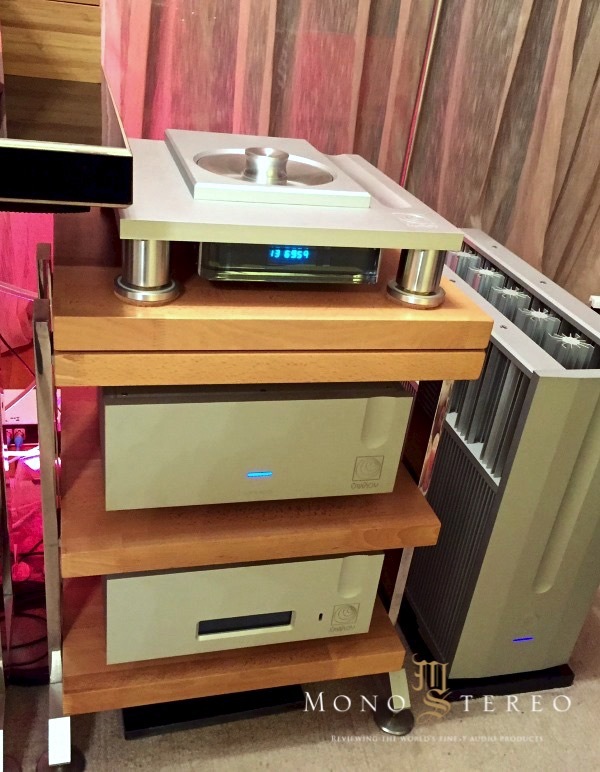 It was presented for the first time in Heathrow Show together with CDT-100 CD player/transport. 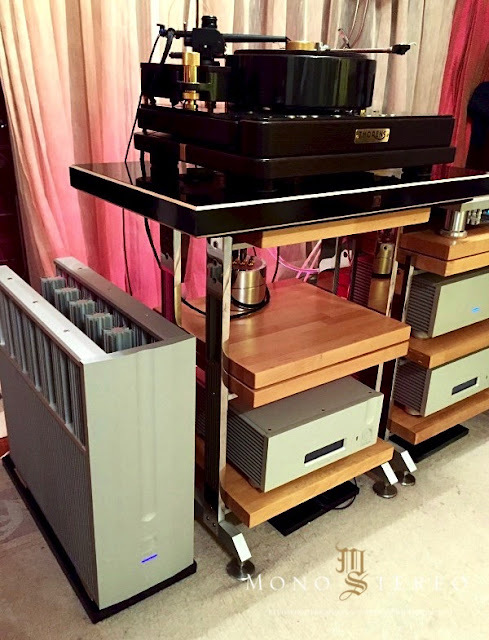 The following year the PST-100 pre-amplifier and DAC were produced. 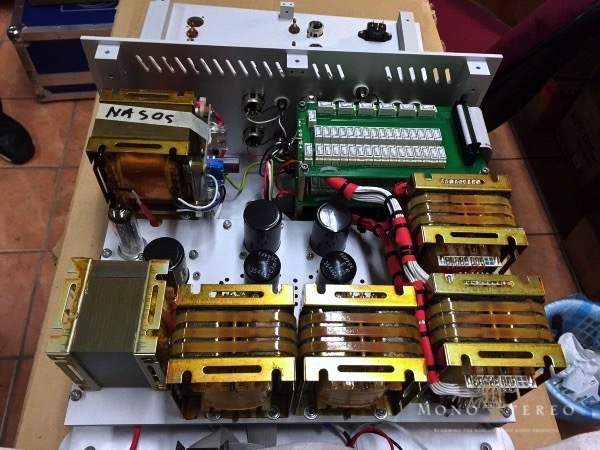 Both were enhanced over time with modifications and current Mk.2 versions of pre and DAC-100 D/A were presented to the market. Phono pre-amplifier VPS-100 was first showcased in Las Vegas 2009. 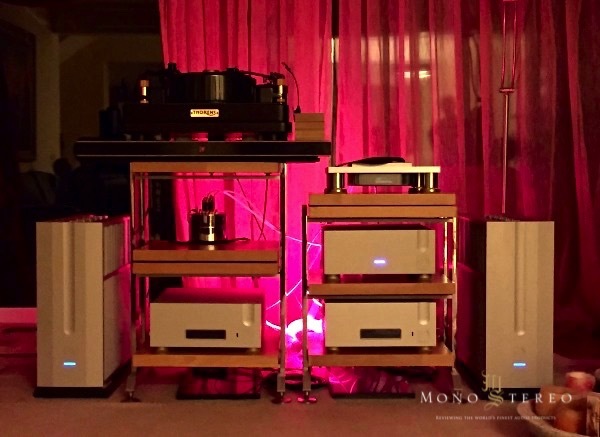 Integrated amplifier Phaethon was launched in Munich High End 2014. This short history and limited product range is in fact a great success story. Indeed, audio critics cannot sing praises of Ypsilon enough. Every model launched becomes an instant legend. It is no mean feat to underpin such success in the high end world dominated by powerful brands and where competition is fierce. Ypsilon’s production takes place in a tiny workshop. 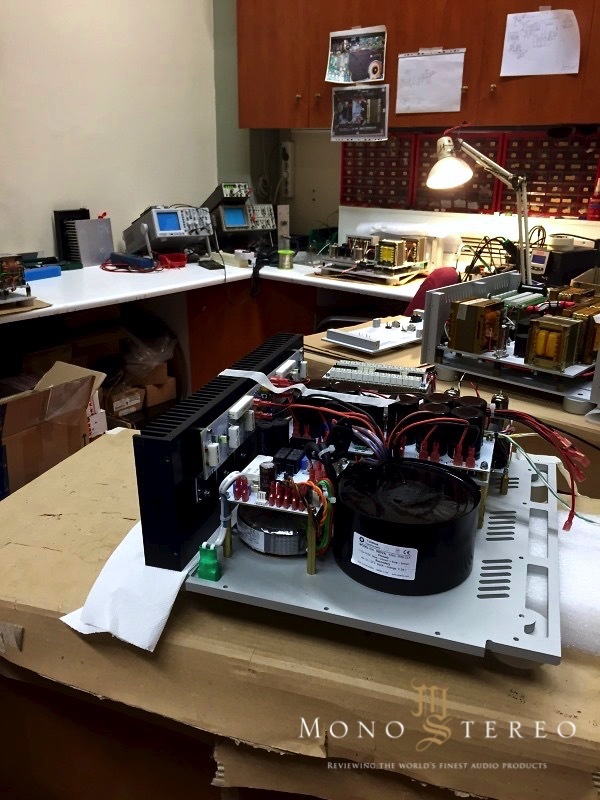 Demetris and Fanis personally take part in production, soldering if needed or winding transformers. Ypsilon produces a maximum of 15 of each model per year. Most of these are sold outside Greece. The circuit designs of Ypsilon products do not fit today’s trends much. 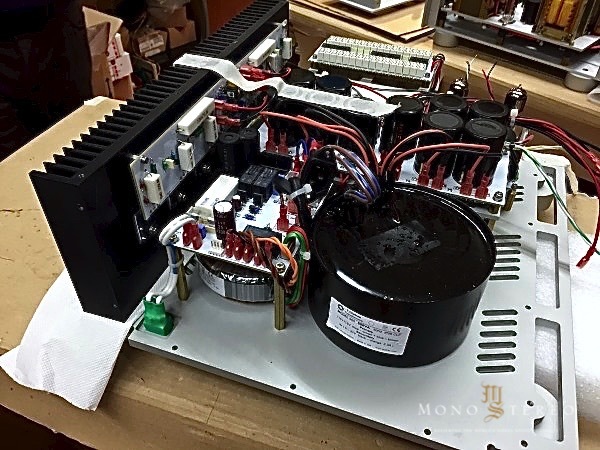 To begin with, they are very simple designs, placing great emphasis on transformer quality in order to minimise any distortion or noise on the signal path. Defining Ypsilon circuit design as two thirds transformer would not be an overstatement. For example, the Phaethon has 11 transformers. Instead of potentiometers, they use transformer attenuators (wound in-house) for volume control. The copper and silver cables used in transformers are specially produced to standards. Most of the products are comprised of hybrid circuits. High quality, rare tubes are used. All the designs have possibly lowest function. 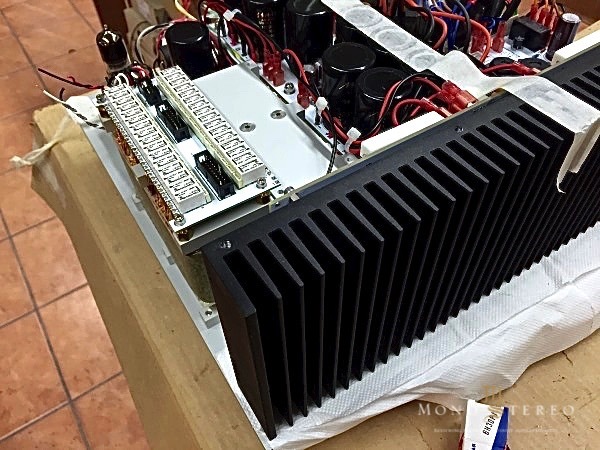 For examples, the VPS-100 phono amplifier only has MM input. For MC cartridges, you have to use one of Ypsilon’s (it could be another brand, but I would not recommend it) step up transformers suited to your cartridge’s specifications. Or as another example, the Phaethon integrated amplifier only has four line inputs. It does not have mono, balance or other similar functions. Backlavas sees each and every one of these as elements affecting sound negatively (and I could not agree with him more). The external design of the products boast the same simplicity: very few buttons, an understated LED screen, a blue light indicating that the device is on. So much so that, there are no control buttons on the CDT-100 CD player/transport, you can only use it with the remote control. You are doomed if you lose the remote control I would say, but it is not a unit that can easily be lost. Speaking of which, all of Ypsilon’s remote controls are made of solid aluminium, quite heavy and large. I would recommend a trip to the nearest hospital in case you accidentally drop one on your foot. The cases and front panels are produced in Germany. The quality of labour is of a standard that can set example to the whole audio world. My son showered Demetris with questions during our workshop visit. Demeteris answered all his questions with great patience. We listened to the reference system in the workshop (CDT-100 CD player/transport, DAC-100 D/A DAC, PST-100 Mk.2 pre-amplifier, SET 100 stereo power amplifier which was their first product of the current range, and their in-house designed speakers), we tested cables, we discussed on the sound. 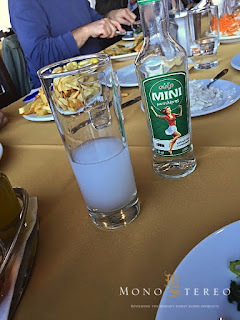 We followed this with lunch in a tavern and then found ourselves in the home of George Heropoulos, the president of the AAC (and the aforementioned director of National Hellenistic Research Foundation, an esteemed engineer of biochemistry). And we completely blew our minds. 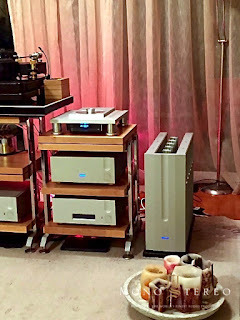 The system in George’s home, with the exception of record player (which I will come to shortly) is all Ypsilon designed. It comprises of digital sound source Ypsilon CDT-100 CD player (used as transport) and DAC-100 D/A digital to analogue converter. There are two PST-100 Mk.2 pre amplifiers in the system (separately for the main speakers and subs). 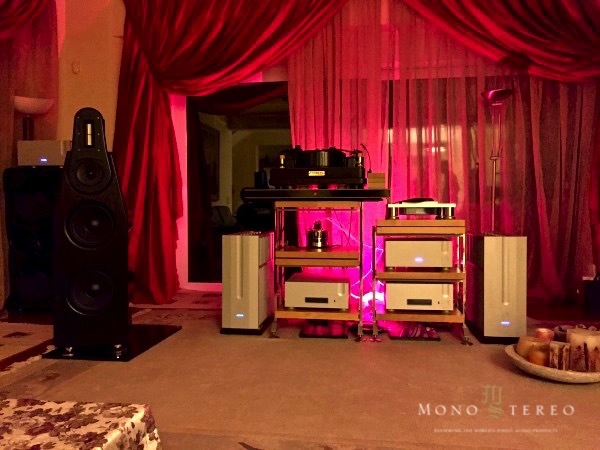 The main speakers are driven by SET-100 Ultimate monobloc power amps; the subs with Aelius monoblocs. The speakers and subs are one of a kind, specially developed for this system by Ypsilon. The main speakers have four driver units. 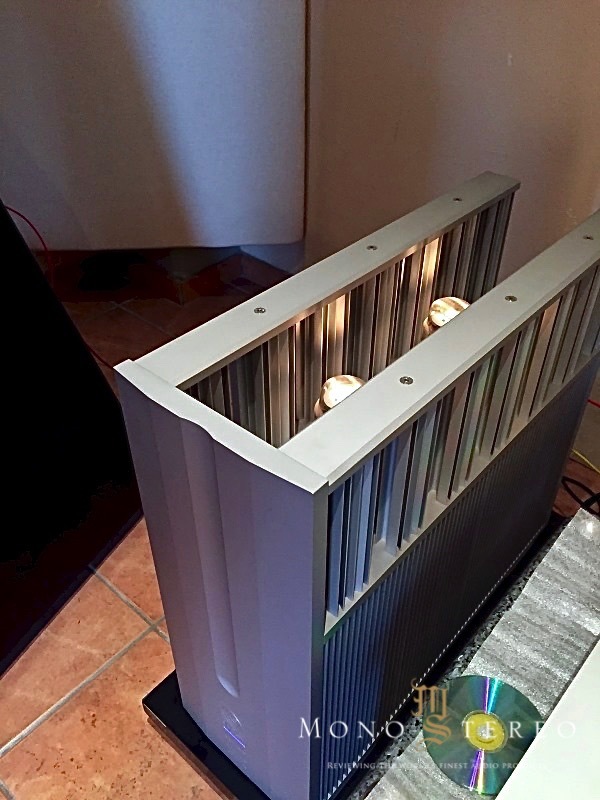 The treble unit is again specially developed by Ypsilon, a ribbon tweeter with transformer. These are speakers that work on a close enclosure concept. The cabinet has been specially produced from a composite material. The subs have two driver units. They have wooden cabinets with front ports. 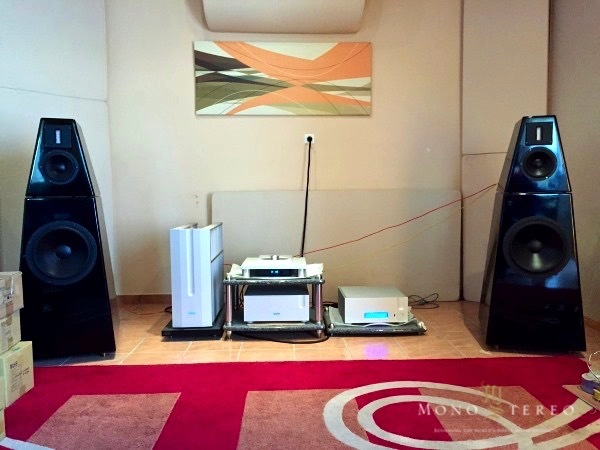 There is an active crossover unit, designed by Demetris between the main speakers and subs. All electronics are special versions, produced with silver wound transformers. Now we are coming to analogue part. 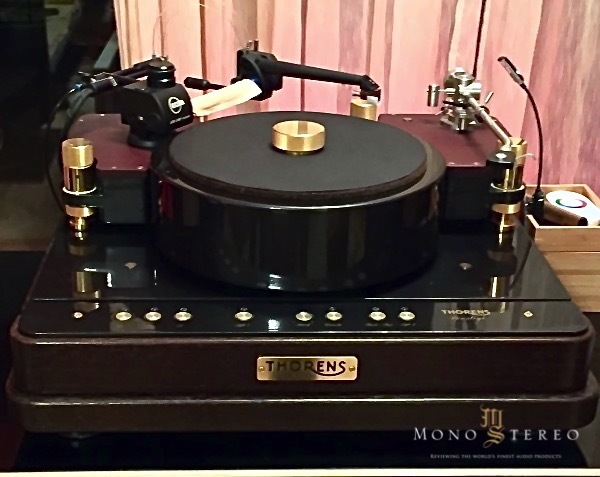 Accompanied by VPS-100 phono pre and two MC transformers, there stood a total fetish turn table for analogue lovers: Thorens Prestige. Thorens launched this turn table in its 101st year as limited edition, with the intention of producing only 101 units. However, it continued to produce on special order and delivered the last Prestige to its owner in 1993. It was priced at USD15000 at the time, according to my research on the internet. Even though I knew the turn table well, I was not really curious about its price at the time. We were all pretty sure back then actually, that the analogue was dead, most of us were only keeping our turn tables for nostalgic reasons or to listen to records we had collected over time. George owns this turn table only by coincidence. He stumbled upon it somewhere in Athens, unused for users in a corner covered in dust. He offered to buy it, obviously knowing its value, the owner asked for EUR15000 and George did not object. The turn table started working as in day one after a service costing EUR500. It looks impressive, a work of industrial art. It has two tone arms mounted: Kuzma Air Line and Fidelity Research FR-64S. They both are highly regarded arms, but I was especially interested in the FR-64S (Kuzma’s oil pump was out of order, would not have meant much even if I was interested). Fidelity Research Inc. was founded by Isamu Ikeda in 1964 and closed after operating until 1985; a victim of digital revolution. All arms produced by Isamu Ikeda, especially the FR-64S were a legend amongst the audiophiles of the period. Ikeda San established Ikeda Sound Labs. years later, as analogue was re-born, and started to produce tone arms and cartridges again. As an owner of Ikeda IT-407, I have a natural sympathy towards Fidelity Research FR-64S. In fact, last year I undertook a lot of research to find a clean one and indeed found an unused FR-64s but the difficulty of bringing it to Turkey put me off. Now this legendary arm was right in front of me with a Shelter 901 cartridge mounted. Shelby Lynne’s Just a Little Lovin’ on the platter, we were all anxiously waiting for the stylus to touch the record. What should one expect from a system like this? I have listened to several systems all over the world. Mostly in high end shops, some in audiophiles’ houses. Then again I have listened to systems costing upwards of a million dollars last year in Munich High End. Magico Q7s and Solution 701s for example. 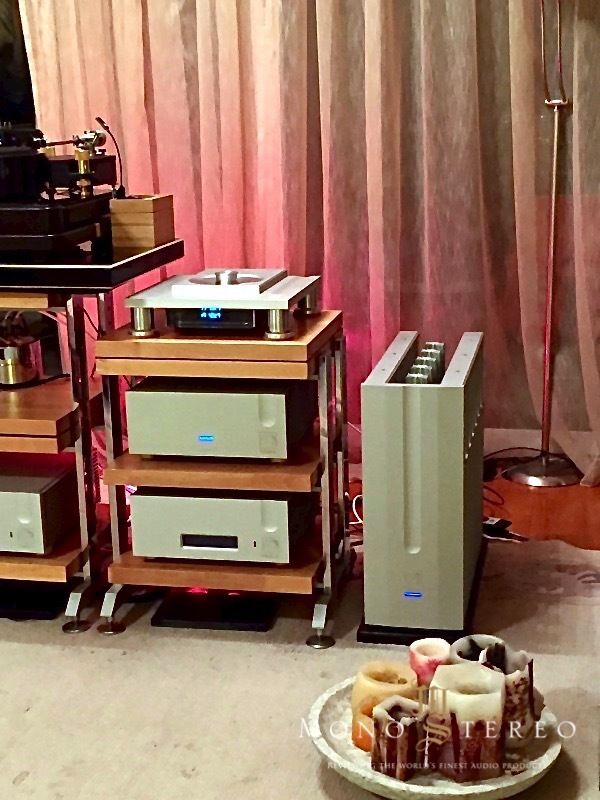 Or legendary Living Voice Vox Olympian driven by Kondo electronics. They were all impressive systems and my expectations were not above these levels. Finally, the stylus touched the record. And I was frozen. I will not talk about the power of bass, the magic of midrange, or the speed of high frequencies. I will not covet such audiophile frets as sound stage, coherency, timber etc. either. In all honesty, I have never heard anything like this. My son had said to me about a week earlier, “You have listened to several systems, I have also listened to expensive systems in various stores, and none of them are like real music, right?” And I had nodded in agreement. After the first moment of surprise, my son whispered in my ear: “It does dad, it does sound like real”. Yes, the vocals, drums, cymbals, double bass, strings, piano – all of them right there, with all the body and reality were playing in the room. In short, there was such an attracting reality pulling the person in, an experience that it is not possible to describe with well known audio terms; there was music, and nothing else. We listened to a few albums in succession and I tried in the meanwhile to compare with systems I had listened to in the past, in as much so as I could remember. For example; the Magico Q7-Solution 701combination that I listened to last in Munich High End which played with an impressive scale and precision, called ‘frighteningly real’ by most was not after all that frighteningly real. Magico had performed in a large room and clearly the scale of the music was more impressive than here but I am not sure if the sound I listened to was one to be addicted to. 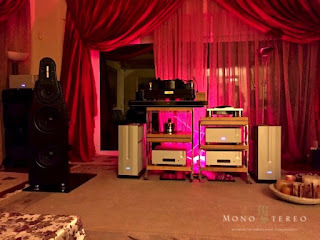 It cannot always be expected that a system that plays technically well is also emotionally impressive (live music experience is completely different; imaging, focus, detail and other similar audiophile criteria has little to do with real life performance). 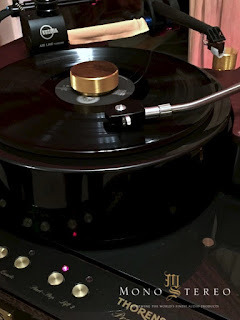 The system we listened to in George Heropoulos’ home more than covers the audiophile criteria that I have covered here (or not covered) but you don’t notice them per se. There are some well versed audiophiles who immediately comment on how a system sounds, and this system seems designed just to shut them off. To listen to such a musical system analytically is almost impossible, and totally unnecessary. All we did all evening was to listen to music in admiration. At some point, I turned to George and said that I would not be able to go to work if I had his system at home. He laughed and told me sometimes he could not either. I think this sentence best summarises our experience at George’s home. I sometimes liken the high-end world to a community full of rich and spoiled men who forego hearing the music in order to capture the reality of sound; an unsatisfied, introverted community with a self devised terminology depending on advanced technology to recreate live music’s magic. Of course I understand non satisfaction which can lead to perfection, but I find it difficult to accept the manifestation of dissatisfaction which strays from its cause like in this case. In this respect, the question of whether innovations in sound technology are actually really a progress, has always remained in my mind. Several devices built with the help of science and cutting edge technology alter our perception by over-emphasising such artifacts of stereo as staging, focusing, imaging, and other qualities; and this change in perception moves us away from the reality of music over time and recreates a new reality whose link to music continues to weaken. This new reality is also supported by the sector through media. 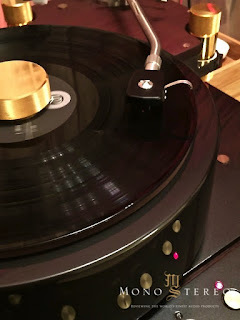 New brands and products enter the market and not to have purchased the most recent version of a component brings about a ridiculous feeling of regret in audiophiles; the equipment gets traded in before a year passes and the system based on consumption continues to chug along. In the meanwhile, a select group of music loving audiophiles find their musical satisfaction in the sound technology between 1930s and 1950s. Single ended-low powered amplifiers, horn speakers with very high sensitivity, giant size cabinets with field coil drivers continue to earn the respect of a marginal group. In fact, equipments dating from those years undergo slight revisions and find prime positions in the homes of this ‘minority opposition’. I am closer in emotion to this minority opposition. I really don’t like the ‘know it all’ audiophile stereotype who listens to systems with a taboo checklist and cannot hear the whole from concentrating on the parts. I do not bless the world of these checklists made of ‘must-haves’ like stage depth and width, imaging, focus, detail, resolution, articulation and such. Although I try to maintain my distance to this corrupted world that the market is trying to draw me into with advertisements and reviews in magazines, I have to admit that it has certain truths and a lot of allure. My expectation of a good audio system is that it should transfer the integrity and emotion of live performance as is. But my ears also search for some of the qualities that I have just described as ‘artifacts’ without exaggeration and drawing too much attention. I am explaining all this for a reason: the system that Ypsilon set up (and continually improves) in George Heropoulos’ house, appeals to those in purgatory, like I am. 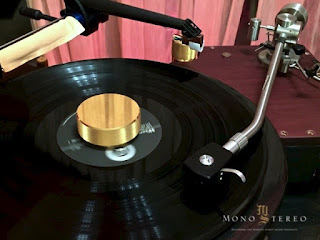 An honest, real and artisan piece of work that uses the positive attributes technology has brought to audio world without falling into the traps of modern world. Difficult not to admire. It was an incredible feeling and a great privilege to witness the success of a handful of people turning electronics into art – in part with inspiration from mythological gods and in part drawing strength from their knowledge and experience of live music – in a tiny workshop by the skirts of Acropolis; and to listen to a system that I would not be able to experience in any audio show, accompanied by George’s hospitality. I could not help but share.